During your formative early years was reading an important part of your life? Oh, yes. My mother introduced me to the joys of the public library when I was quite small and it was always a huge treat to go there and borrow books, especially when I had my very own junior library card! I have such fond memories of my first library that when I returned to the UK after many years abroad I searched it out, hoping it was still there. 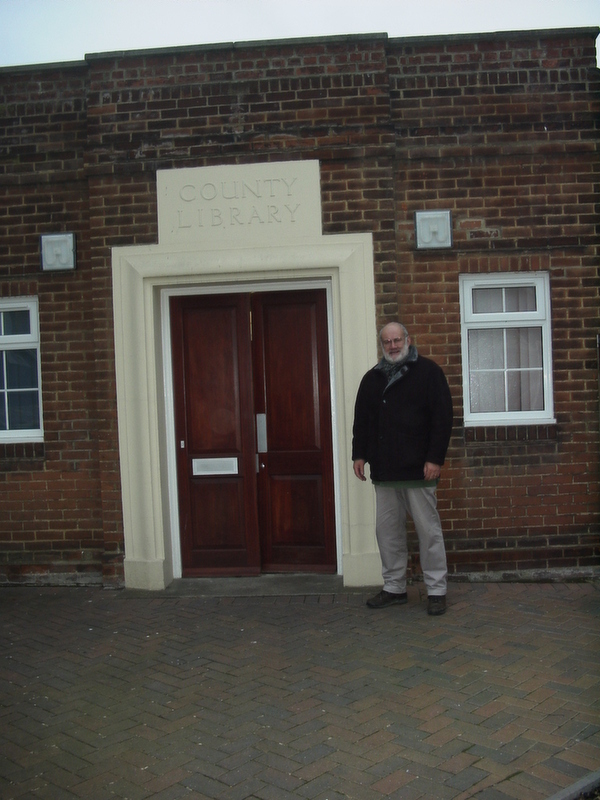 Sadly, it had been morphed into a council building, but amazingly, ‘Library’ is still emblazoned above the door. As a boy I had a pretty eclectic range of interests but anything to do with the sea was always there at the top of the list. When I joined the Royal Navy I had some treasured copies of Forester’s Hornblower books that I reread many times; I was actually at sea when he died and I was devastated that his wonderful stories would be no more. You trained as a shipwright and I once heard you say you would feel quite at home in one of Kydd’s ships, adze and whipsaw in hand. Can you tell us a bit more about that period in your life? I went to a prestigious English grammar school but didn’t do particularly well scholastically, spending my time watching the low grey shapes on the horizon and dreaming about the sea. I think my father had other ambitions for me but from an early age I always knew I wanted to join the Navy, and signed up for the saltiest branch of all. I trained as a shipwright in the Navy (a four-year apprenticeship), and am one of the not that many remaining chippies qualified to work on wooden ships of the big sort. At first glance, such skills may may seem obsolete for the modern navy but when I was involved in the Melbourne/Voyager tragedy it was we shipwrights who were vital in damage control and preventing further deaths. I was actually out with the seaboats that night keeping them afloat while pulling in survivors. When I left the navy I worked for a time at Purdon & Featherstone (established in 1853, and sadly no longer in existence) in Hobart, Tasmania. This was one of the major slip yards for wooden boat construction and repair in the state. Some beautiful traditional wooden boats passed through there. Has your experience as a shipwright influenced your writing? I think all life’s experiences must play a part in the creation of a novel. Certainly many of the sights I saw on my voyages around the world are brought to bear in my writing. As to my training as a shipwright – this gave me confidence to write several episodes in the series where there is quite some detail about Georgian naval dockyards. I can also look at ship models – especially the scratch built ones – with an appreciative eye and because they are on a small scale I sometimes am reminded of things that I later bring to bear in my writing. CARIBBEE is your fourteenth Thomas Kydd novel. Over the previous books, your plots have been closely tied to historical events. How do you approach development of your storylines which wrap around actual history? To me, it is crucial to remain true to the historical record. I believe it would be a great disservice to both modern readers and those who lived in days gone by not to do so. I spend a great deal of time doing research before I write. Having said that, there are occasions when I believe it is permissible to vary, not the sequence of events, but time alone – for the sake of the story. I’ll give you an example, in KYDD, my first book, Tom finds himself at sea in the old Duke William pretty quickly. It would have been a pretty boring read to just have him aboard, swinging to anchor for weeks, as they sometimes did. Do you ever encounter writers block? If so, how do you work through it? Fortunately I’m writing about such a fascinating period in history that I’m usually carried along by the momentum of those glorious times. The Georgians were in many ways much larger than life than most of us today; they had a wonderful phrase, ‘bottom’ to describe the almost superhuman courage often found in tight corners. I guess, also, that because I do very detailed research and planning before I set pen to paper I know where the story is going and am not bogged down by false starts. If I do need to fine-tune some plot point I find that being able to walk/talk with Kathy along the banks of the nearby River Erme is a great boon. Mind you, once we just couldn’t seem to find a solution and it took six hours of ‘pacing’ before the answer finally revealed itself. Did you and Kathy get to return to the West Indies for CARIBBEE? Sadly, no. It’s a long way from Devon, and quite an expensive trip! However we did have over three weeks there on location research for SEAFLOWER, and I knew Kydd would be returning there at some point in his career. We took hundreds of photographs and extensive notes so I wasn’t short of material for CARIBBEE. I also have a full set of Navy electronic navigation charts of any region which I have to hand as I write. How much does music mean in your life? I find great joy in music. Along with reading and good food it’s one of life’s great pleasures. Have you any skill at music? Do you play an instrument? Sadly, although I have a good musical ear, I am an amateur in terms of skill. In the Navy I played a horn in the brass band. Great fun! Later, I bought myself a valve trombone, which I tootled on from time to time. But my musical sensibilities have become much more sophisticated and developed over time – and I could no longer bear to hear myself play. Do you play music when you are writing? No, never, as much as I would like to. Writing for me is an all-engrossing activity. I am a ‘visile’ – I have to see the story unfolding before my eyes before I can write it. If you were cast ashore on a deserted island, what five musical pieces would you choose to have with you? Besides listening to music, what do you like to do in your spare time? Doesn’t seem to be much spare time these days. Kathy and I do enjoy walking – Devon has some wonderfully scenic areas to explore – and I’m also partial to a delicious meal with all the trimmings and a good Red. Again, we’re very lucky to live in Devon as the produce grown here is next to none. We get an organic vegetable box regularly and it is always a delight to see what Kathy will conjure up from the exotic ingredients. Why did you recently decide to initiate a move to a brand new website? This was prompted by the retirement of the Bosun, who’d compiled a great newsletter for over ten years. But things move on, and it was a chance to look at the way I interact with my readers in a holistic sense. I was already tweeting, and posting on Facebook and Pinterest so it seemed a good idea to start a personal blog. A website with all the information about me and my books plus an interactive blog seemed to fit the bill. Feedback so far has been very positive. I think social media are becoming more and more important for authors today. When the first Kydd novels came out a decade or so ago no-one had heard of twitter and the like and blogs were uncommon. Although these are all time-consuming I find I am enjoying the participation greatly – and as long as I am disciplined about the time I spend writing the Kydd books I hope to explore other possibilities, too. Julian: You mention the “Melbourne/Victoria tragedy” in this blog. I couldn’t find any explanation of that on Google. I could only find mention of fires. The event you had a role in probably isn’t one recognizable to many of your international readers (I live in America). With your fans spread across the world, this seems to be a rare incident of you failing to take such cultural/historical differences of memory into account. Would you please explain your reference in your next blog? Thanks. You misread the post. It was Melbourne/Voyager. This was a tragic collision between two warships of the Royal Australian Navy – the aircraft carrier HMAS “Melbourne” and the destroyer HMAS “Voyager”. It occurred on the evening of 10 February 1964. The two ships were performing manoeuvres off Jervis Bay, when “Voyager” sailed under “Melbourne”‘s bow. She was cut in two and sunk, and 82 of her crew killed. Jules: I miss the Bosun. But I also greatly enjoy your blog. Thank you. 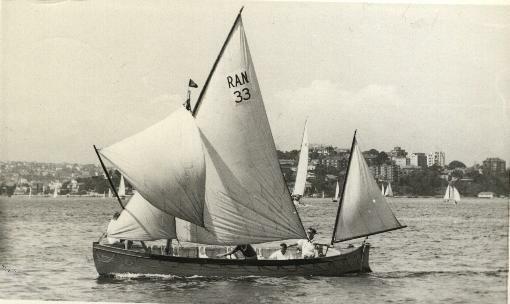 The photograph of the Whaler under sail brought memories for me as I did my pre-sea training at King Edward VII Nautical College at 680 Commercial Road, Whitechapel, London; and we spent Wednesday afternoons sailing, and rowing, the college’s Whalers up and down West India Dock. There were two of them named ‘Lecky’ and ‘Sumner’ after the navigational pioneers – pity there wasn’t a Marc St Hillaire but that would have required a bigger name board! Mention of the river Erme also brought back memories as I often used to visit Mothercombe with its lovely unspoilt little beach at the mouth of the Erme in the 70’s; both by boat and also by car. As I recall it was part of the Mildmay-White estate and only open to the public on certain days. I also participated in the ‘Spanish Wrecks’ archaeological diving exploration by Alan Bax, also in the 70’s when we were allowed in on non-public days. I had then what I thought was the most exciting moment of my diving life when I discovered an enormous iron anchor in the kelp filled gullies offshore, only to find that my buddy had found it first and tied his line to the other end! As a part-time sailor from Connecticut I find your books a delight. We will be traveling to England this December to visit friends in the Bristol area. Then we are off to New York from Southampton on the Queen Mary 2.. Have not read the latest but will press our library to get it. How will you be treating the War of 1812? Should be most interesting.